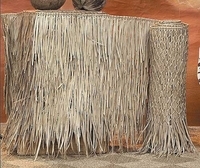 Description of Mexican Rain Cape Thatch Panel With Class A Fire Retardant: Mexican Rain Cape makes it effortless to convert ordinary structures into tropical island retreats with its shaggy fringe thatch exterior and woven knotted interior. Specifications of Mexican Rain Cape Thatch: Hand-woven palm leaf sheet is for 48" H x 20' W x 1" thick and weigh 44 lbs each panel. You get 1 long thatch panel with class A Fire Retardant for this price.